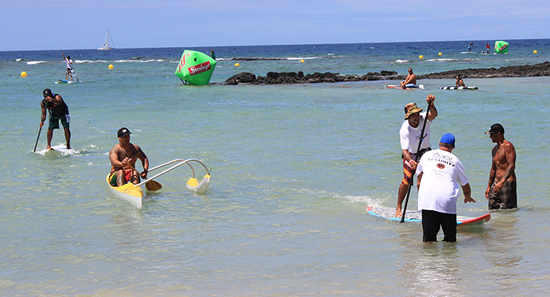 More than 150 people took to the pristine waters of the Kohala Coast on Saturday, Sept. 29, for the second annual Hulakai Stand Up Paddle (SUP) Race For Fitness that saw Stand Up and Outrigger Canoe paddlers race 7.2 miles from Kiholo Bay to the Mauna Lani Bay Hotel & Bungalows. 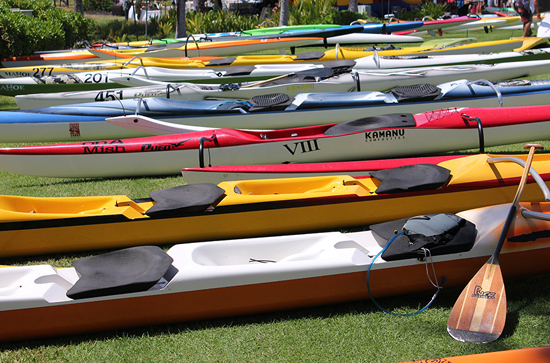 The race is Hawaii Island’s biggest paddling fitness event for all ages and levels, with participants ranging from 12 years through to 76 years of age. The event is about celebrating the heritage of paddling in Hawaii and the evolution of paddling as one of the most popular water sports and fitness workouts in the world. The fastest team to the finish line was the OC2 duo of Au and Lindsey from Keauhou with a time of 1.02:16. The fastest OC1 male paddler was Justin Warren with a time of 1.07:12. The fastest female in the OC1 division was Noelani Spencer with a time of 1.11. The male SUP winner was Jerry Bess with a time of 1.15:54, and the female SUP winner was Tammy Aipa Napoleon with a time of 1.38:41. Paddlers and their friends and family also enjoyed a post-race BBQ and celebration at the Mauna Lani Bay.